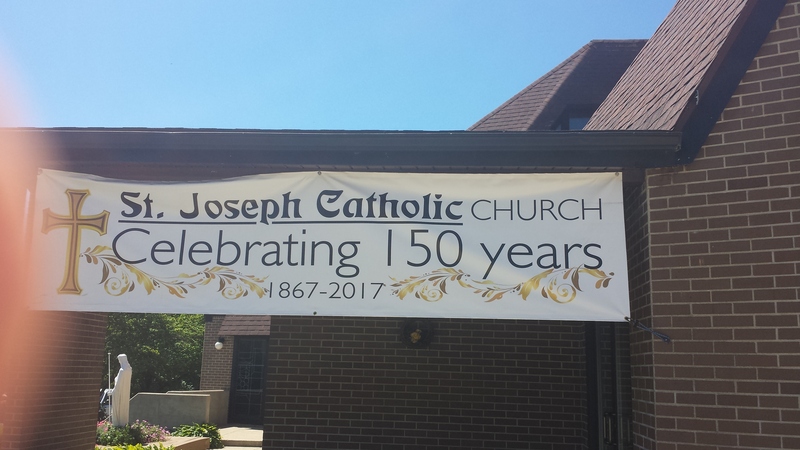 This past Sunday, Bruce and I attended a wonderful celebration: the Sesquicentennial of St. Joseph Catholic Church in Rockville Indiana. Bruce was born in Belleville, IL but his family moved to Indiana when he was very young. His family eventually settled in Rockville, among the beautiful rolling hills and famous covered bridges of Parke County. Some of the family still lives there, including my amazing mother-in-law. We attended Mass, and were very happy to see the church was packed! The current pastor, Father Varghese, was joined by two representatives from the Archdiocese of Indianapolis (they are in between bishops) and a former long-time pastor, Monsignor Moran. We arrived a bit late (oops, didn’t know about the special event time) and so we stayed in the back “cry room” with several of our nieces, nephews, and great-nieces & nephews. It was fun to point through the window of the cry room to special moments, like the priest incensing the altar after the gifts were presented. Passing my faith on to others has always been important, but as I grow older it has become even more so. 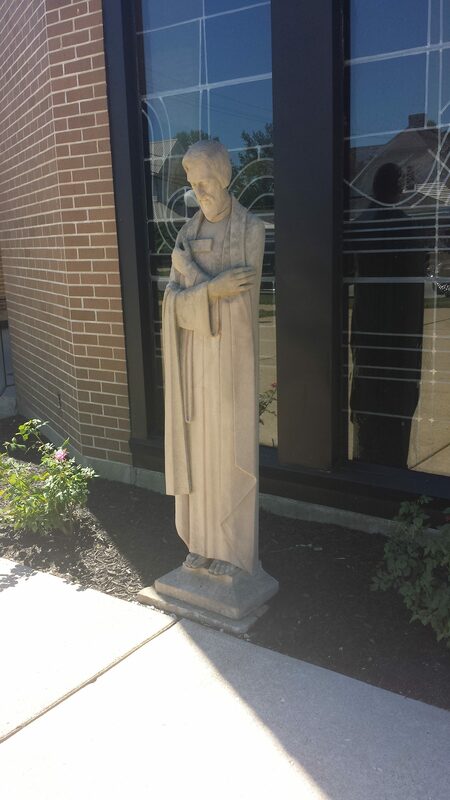 After Mass, a new grotto was blessed and everyone headed to the church hall for a delicious meal and many well-deserved acknowledgements to the people of this wonderful, friendly, small parish. My brother-in-law, George, is the president of the parish council, and he emceed the reception beautifully. As he introduced Monsignor Moran, he got a bit choked up; Bruce did, too. 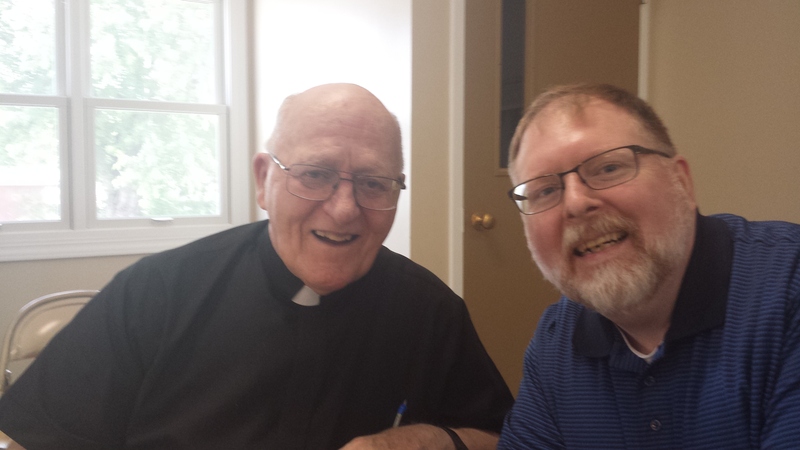 I have heard many wonderful stories of this good and holy priest. Everyone was so happy that he was able to be a part of the celebration. I had the opportunity to tell a few people about my first memory of St. Joseph Church. It was on January 6, 1993. I had been on vacation over Christmas, visiting family in South Carolina and Florida. While we had been friends for a couple of years, at this point Bruce and I had only been dating a couple of months, and my trip had been planned for quite a while. I was amazed at how much I missed him while I was gone! I flew back on that Sunday, arriving at the Indianapolis airport in the afternoon. Bruce picked me up, but before driving me home, we went to St. Joe’s for their “3 Kings” play. George’s three oldest girls were in the play, while the youngest sat with him and his wife Ruby. Bruce sat to the side, handling the lights, which wasn’t too tough in the tiny church…off and on. I sat with George and Ruby and their youngest, along with my not-yet-mother-in-law Dorothy and two more Padan brothers, Chris & Denny. The girls were cute, of course, and everyone had a great time. Afterwards, Bruce had to drive me home. Once we arrived at my house, he embraced me like never before. Then, so sweetly, he asked, “Will you marry me?” I was surprised, and yet I wasn’t. There was a certainty to my love for him…and so I said “Yes!” After this major event, I knew I needed to call my parents to let them know. I called, and made sure both were on the phone. “Well, the flight was fine…saw Bruce’s nieces in their play…he drove me home…he proposed…I said Yes.” I heard some tearful laughter; it probably wasn’t easy for them to hear this. At this point, neither of them had met Bruce. It’s been 24 years, so I think I can safely say I gave the right answer! Forever sounds good to me!